Redis for Pivotal Cloud Foundry (PCF) can be used both via Pivotal Apps Manager and the Cloud Foundry Command Line Interface (cf CLI). Both methods are outlined below. You can find an example app has to help you get started with Redis for PCF. Download the example app by clicking this link. For recommendations regarding Redis for PCF service plans and memory allocation, see the On-Demand Service Offering and the Shared-VM Service Offering. A PCF installation with Redis for PCF installed and listed in the Marketplace. The two Redis services are listed differently in the Marketplace, ensure that the service you want to use is enabled. A Space Developer or Admin account on the PCF installation. Every app and service in PCF is scoped to a space. To use a service, an app must exist in the same space as an instance of the service. Use the cf CLI or Apps Manager to log in to the org and space that contains the app. Make sure an instance of the Redis for PCF service exists in the same space as the app. If the space does not already have a Redis for PCF instance, create one. If the space already has a Redis for PCF instance, you can bind your app to the existing instance or create a new instance to bind to your app. Bind the app to the Redis for PCF service instance, to enable the app to use Redis. The service must be available in the Marketplace for its space. An instance of the service must exist in its space. If the output lists p.redis in the service column, on-demand Redis for PCF is available. If the output lists p-redis in the service column, shared-VM Redis for PCF is available. If it is not available, ask your operator to install it. 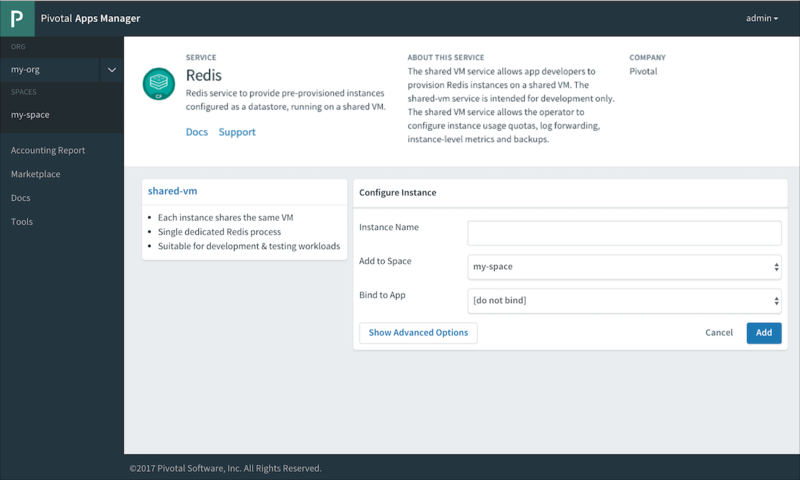 p-redis             shared-vm                 Redis service to provide pre-provisioned instances configured as a datastore, running on a shared VM. p.redis             cache-small, cached-med   Redis service to provide on-demand dedicated instances configured as a cache. Any p.redis listings in the service column are service instances of on-demand Redis for PCF in the space. Any p-redis in the service column are service instances of shared-VM Redis for PCF. You can bind your app to an existing instance or create a new instance to bind to your app. Shared-VM service instances have been pre-provisioned by the operator. This means, if an instance is available, the app developer can provision it immediately. These plans are both listed under the p-redis service in the Marketplace. SERVICE_NAME is a name for your service instance. Unlike pre-provisioned services, on-demand instances are created asynchronously, not immediately. 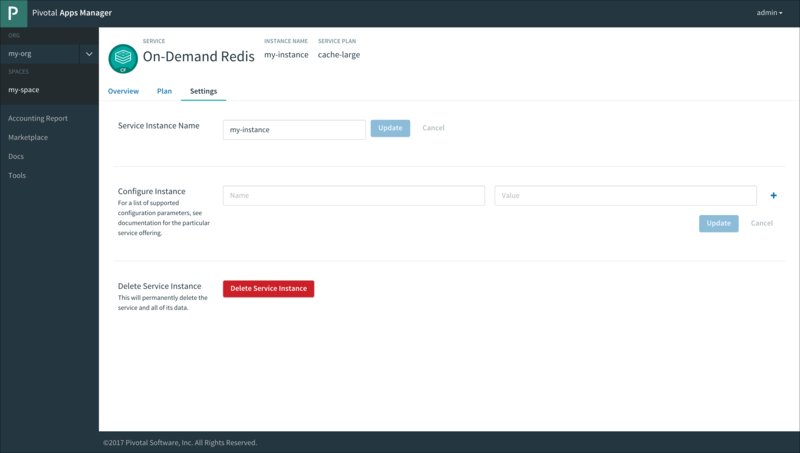 On-demand plans are listed under the p.redis service in the Marketplace. CACHE_PLAN is cache-small, cache-medium, or cache-large. SERVICE_NAME is a name for your service. As the On-Demand instance can take longer to create, the watch command is helpful as a way to track when your service instance is ready to bind and use. If you get an error, see Troubleshooting Instances. For information on the on-demand cache plans, see On-Demand Service Plans. From within Pivotal Apps Manager, select Marketplace from the left navigation menu under Spaces. Select Redis from the displayed tiles in the Marketplace. 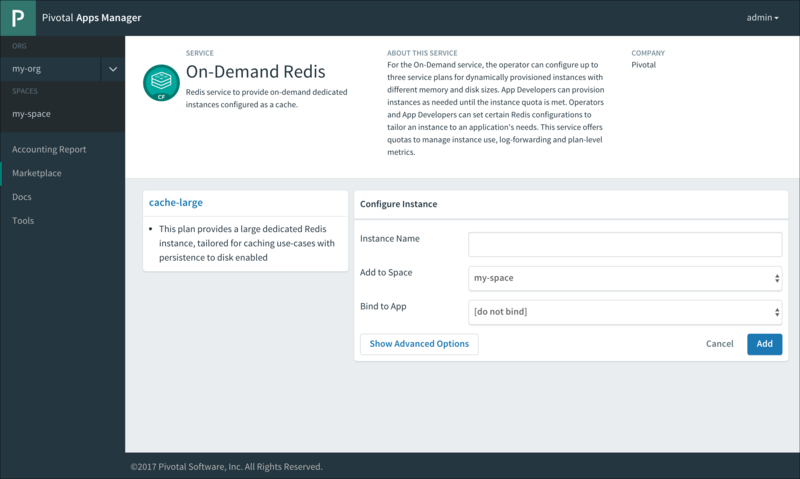 Click on the appropriate Select this plan button to select the required Redis Service Plan. In the Instance Name field, enter a name that will identify this specific Redis service instance. From the Add to Space dropdown, select the space where you or other users will deploy the apps that will bind to the service. Select Redis On-Demand from the displayed tiles in the Marketplace. For an app to use a service, you must bind it to a service instance. Do this after you push or re-push the app using cf push. To bind an app to a Redis for PCF instance use $ cf bind-service. Run cf services to view running service instances. APP is the app you want to use the Redis service instance. SERVICE_INSTANCE is the name you supplied when you ran cf create-service. Select the app that you want to bind to the service. A page displays showing the already bound services and instances for this app. Click Bind. A list of available services displays. Click the Bind button for the Redis service you want to bind to this app. The On-Demand Service allows operators and app developers to customize certain configuration variables. Operators can customize the memory size, org and space access, Redis Client Timeout (default 3600 seconds), Redis TCP Keepalive (default 60 seconds), Redis Max Clients (default 1000), and can enable Lua Scripting. App developers can customize the following parameters. See the Redis documentation for more detail. slowlog-log-slower-than 10000 0-20000 Sets the threshhold execution time (seconds). Commands that exceed this execution time are added to the slowlog. slowlog-max-len 128 1-2024 Sets the length (count) of the slowlog queue. Note: Arbitrary parameters are only supported for on-demand service instances. Shared-VM plans do not support the use of CLI commands with arbitrary parameters to configure service instances. For both scenarios, the -c flag requires a valid JSON object containing service-specific configuration parameters, provided either in-line or in a file. If the update is not successful, an error is displayed with a description of what went wrong. Here is an example where a hyphen is added to the noeviction setting. While creating the instance, after you select the plan, click advanced settings. After creating the instance, navigate to the instance Settings page. In the parameters fields enter each property you want to change and its new setting. Click the + sign to add more parameter fields. Depending on the page you are on, click either Add or Update. If the update is not successful, an error is diplayed with a description of what went wrong. Here is an example where we forgot the hyphen in the volatile-lru setting. All Redis for PCF instances are password-protected and require authentication. This is enforced with the requirepass directive in the configuration file. Create a service-key for your Redis instance using the command cf create-service-key INSTANCE-NAME SERVICE-KEY-NAME. Retrieve the password using the command cf service-key INSTANCE-NAME SERVICE-KEY-NAME. Redis for PCF data is accessible from apps bound to that instance. Some Redis for PCF users bind the opensource cf-redis-commander app to view instance data. This app is not maintained by the Redis for PCF team, and Pivotal cannot guarantee its performance or security. Environment variables are how Cloud Foundry communicates with a deployed app about its environment. To access the environment variables, bind your app to an instance and run cf env APP_NAME from the cf cli. Run cf env APP_NAME with the name of the app bound to the Redis for PCF instance. Note: You can also search for your service by its name, given when creating the service instance, or dynamically via the tags or label properties. In your app code, call the Redis service using the connection strings. 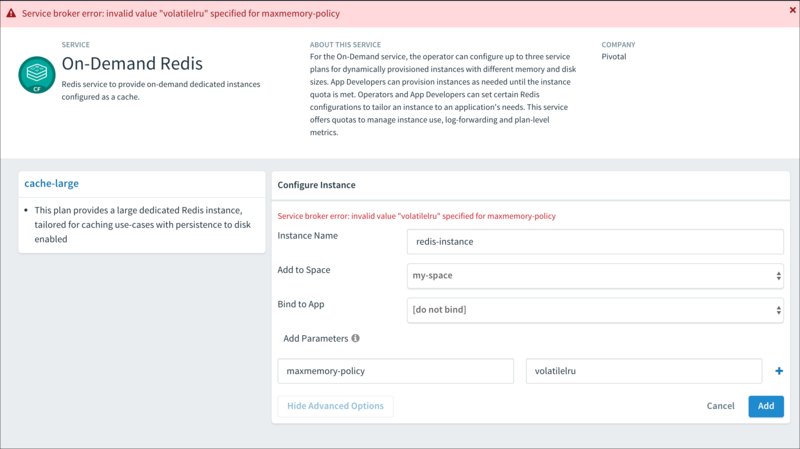 Shared-VM plans provision Redis instances with a max-memory policy set to no-eviction. After setting keys, use EXPIRE to set key expiry, or use SETEX to set key value and expiry at the same time. Explicitly delete keys after the app is done using them. Add a lua script to delete keys after a specified time period. To access metrics for on-demand service instances, you can use Loggregator’s Log Cache feature with the Log Cache CLI plugin. Log Cache is enabled by default in Pivotal Application Service (PAS) v2.2 and later. Where SERVICE-INSTANCE-NAME is the name of your service instance. For more information about the metrics output, see Redis KPIs. For more information about how to enable Log Cache and about the cf tail command, see Enable Log Cache. Sharing a service instance allows apps in different spaces to access the same Redis instance. Tile operators must enable this behavior and a cf admin must turn it on. For more information about this feature, see Sharing Service Instances in the Cloud Foundry documentation. REDIS-SERVICE-INSTANCE is the name of the Redis instance. OTHER-SPACE is the name of the other space you want to share this instance with. OTHER-ORG is the name of another org you want to share this instance with (optional). WARNING: Redis only has one password and password rotation does not occur on unshare. After unsharing a service, any bound apps continue to have access to the Redis instance until the apps are restaged. When you delete a Redis service instance, all apps that are bound to that service are automatically unbound and any data in the service instance is cleared. Run cf delete-service SERVICE-INSTANCE-NAME and enter y when prompted to confirm. In the service instance Settings page, click Delete Service Instance.